The Compo Beach Bathhouse and Pavilion is set to be renovated as early as this fall. WESTPORT — Most people are in agreement the Compo Beach Bathhouse and Pavilion — built in 1931 — could stand some renovations. Exactly how the work will be carried out on the historic structure, however, is yet to be determined. Back in 2015, the Parks and Recreation Commission voted to replace the bathhouse and pavilion structure, but Jen Fava is recommending the town go a different route due to economic uncertainty in the state. In a May 15 memo to the commission, the Parks and Recreation director recommended repairs to the facility instead of completely replacing it at an estimated cost of $4 million. Fava pointed out if it was replaced, the building would have to comply completely with Federal Emergency Management Agency requirements, one of which would require raising the structure higher off the ground. By repairing the existing structure — valued at $845,100 — it does not have to comply with all FEMA requirements if the town does not spend more than half its value on repairs. According to the memo, the current plan for repairs includes $120,000 to replace the roof of the pavilion, $20,000 to install hurricane ties to the roof, $160,000 to renovate the bathrooms and $25,000 to replace the old plumbing lines — a total bill of $325,000. He expects the work to start in the fall. Westporter Sal Liccione, who often visits the beach, said he thinks the decision to repair the structure, instead of replace it was a “great idea” and he is “very happy” that the town will not be taking the building down. 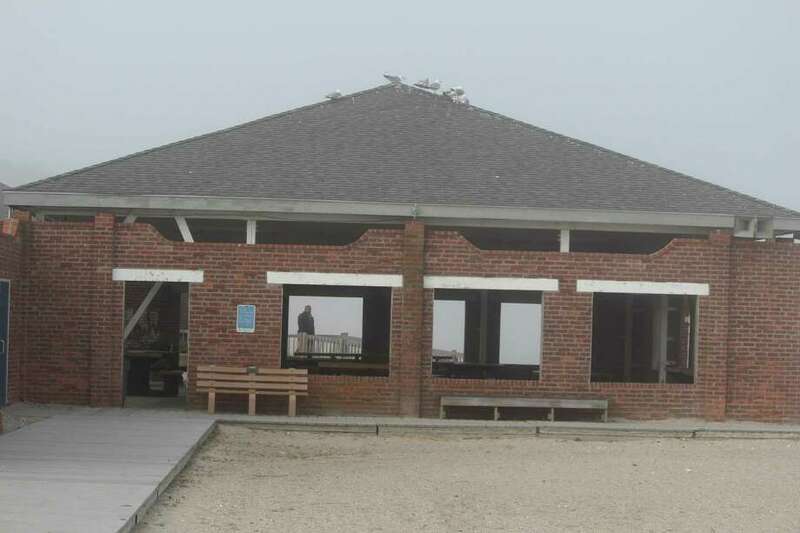 As far as immediate repairs, First Selectman Jim Marpe said the town is conferring with a structural engineer to see if any such work needs to be completed on the roof to ensure the safety of beachgoers this season. Despite the current plans, some things are still up in the air regarding the iconic structure’s future. While the Bathhouse and Pavilion fall within the Compo-Owenoke Historic District, which listed on the National Register of Historic Places, Fava is uncertain if that historic status prohibits replacing the structure. In 1991, the town of Westport created the National Register District. Morley Boyd, a local historian, said even though the Bathhouse and Pavilion is within the district, there are no statutory restrictions on making changes to the building. But, he added, because it is listed as a contributing property to the National Register District, its historic importance should be taken into serious account when making any changes. “When the town does something like that, the ethical argument is that you need to consider the welfare of the building that you put in National Register District,” Boyd said, noting that if the town is not careful about preserving historic aspects of the facility, it could be de-listed from the historic district. “People in town just love the building. It’s one of the most iconic images of Westport,” Boyd said. If the structure is determined to be to part of the National Register of Historic Places, the town could apply for a FEMA waiver that would allow for the town to expend more than $422,550 on renovations, the amount previous thought to be the threshold by the Parks and Recreation department. Fava plans to figure out exactly what the historic status means for the Bathhouse and Pavilion. The Compo Parkway resident, however, was concerned that the Parks and Recreation Department was unclear about the bathhouse’s possible listing on the National Register of Historic Places.